Dreams drift like cottonwool in the small-towns of India. 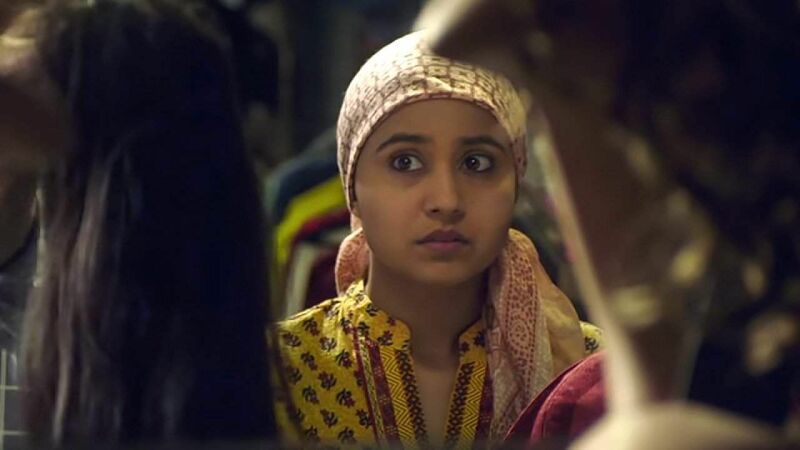 Enakshi (Shweta Tripathi) — a school girl in Siliguri with alopecia — wakes from scenes of her own sangeet, then blames her parents for invading her dream with theirs. Her father, Anup (Vipin Sharma), sells watches in the local market. He listens to a fellow shopkeeper detail the pleasures of flying in a plane (“You land before you finish your food”), and resolves to fly coach once. These rippling, wafting desires — tenuous in nature but clenched with resolve — infuse Gone Kesh with a sunny, seeking warmth. The title is a double entendre. Besides alluding to Enakshi’s premature balding issue, it also plays on ‘Gone case’ — a common catcall in Bengali school parlance bestowed on kids deemed ‘beyond repair’. Enakshi hates the sound of it. Her confidence takes major beatings. Beset with gaping patches, she shaves off her head completely and scurries under a headscarf — and later, under a synthetic wig. Ten years pass, and she grows into a sad, fake-smiling thing, coyly entertaining clueless suitors or customers at the mall, where she sells cosmetics. One day, in the vein of Gully Boy, a talent hunt brings some hope — she signs up for a dance competition at the risk of losing her job. But Enakshi’s problems are far removed from those of Ranveer Singh’s Murad: she has comparatively loving parents, and it’s not money or fame she’s after. Instead, her tug is more internal. Dancing as a performance art is very much a slave of “appearance”, and it is this personal (8) mile that Enakshi shudders to walk. Even in a town this small, some roads take a lifetime to pace. Debutant Qasim Khallow keeps his filmmaking straightforward, with no urgency to impress. The details are observant without being overstated. There’s a curious obsession with cuisine that made me hungry and homesick: Enakshi’s mother (a lovely Deepika Amin) ladles out delicious-looking luchi and mutton; in a fitting tribute, a romantic scene unfolds at a momo place named after Wong Kar-wai — another director perpetually obsessed with food. Abhi Dange’s camerawork is gracefully basic, which somewhat jars with the strained background score. The modest soundtrack — by Kanish Sharma, Bharath-Hitarth and Bishakh Jyoti — boasts an inventive reworking of Dil Dhoondta Hai, so well done I almost forgot about the original. Gone Kesh goes slack with the drama at crucial junctures, which makes the second half predictable. Still, this film is enough of a joy. The asides are sweet and the performances likable, and it’s particularly delightful to see Vipin Sharma — always the token angry dad in our movies — go out on a limb for his child. As the film rightly hints, ‘nourishment’, both of the head and of the heart, begins at home.